The Sunfish Spectacular was copied from the Austin Angler’s Perch Off. 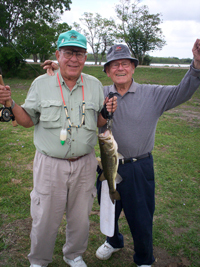 The Perch Off was the brainchild of Robert McCurdy, owner of the Austin Angler, and as many will remember he was a tough cookie. He won the first annual Perch Off and any others that he wanted to win. He wouldn’t allow anyone in the room when he weighed the fish and didn’t mind fishing right through an area that others were working. In 1985 John decided that the Texas FlyFishers should have a similar opportunity for lots of gamesmanship and maybe,or better still, a little plain old cheating. John ran the event for the club for many years and tried a number of things to make it more sporting. One year he decided not to announce the location. You had to ask someone who knew where it was going to be held. As John was the only one that knew, a few of the more clever club members actually asked him and the word got around. A few “slow witted” members never asked and complained that they were denied an opportunity to compete that year. One year John announced that as bass were sunfish participants should make sure they had the right kind of files for catching bass. A surprising number of members took the bait and showed up with bass flies only. Of course, in keeping with the spirit of the gamesmanship, John announced on the day of the event that bass would not be considered legal entries. Members weren’t very happy with John for the switch at the last minute but really gave him a hard time when he announced that, once again, he was the winner. According to John there was only one call for his removal as Weighmaster. That came when John declared the Sunfish Spectacular officially over about two hours early to protect his grandson Bobby’s lead. John Beck who caught a larger fish 3 minutes after the contrived end never forgave John. John’s coaching for future weighmasters was that a great weighmaster who is not happy with the outcome of the event can add some intellectual questions as a condition of winning. One good question that John posed for future weigh master use was “who tied the first Rat Faced McDougal fly”.